This production opened on November 10, 2017 and closed on November 19, 2017. An original adaptation of the award winning novel by local author, Kimberly Newton Fusco. This is the story of Cornelia, a girl trying to find her voice and make her way in the world. Not an easy task for a girl who stutters and can barely say her own name. Author Kimberly Newton Fusco will be joining us on select nights! 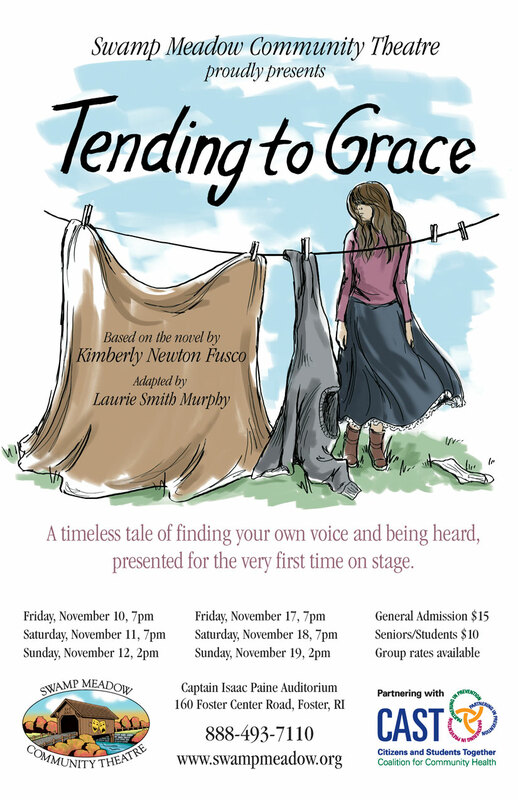 We are pleased to have our friend and author of the novel, Kimberly Newton Fusco, on hand for two special nights during the run of Tending to Grace. On Friday, November 10th, and Saturday, November 18th, Kim will begin our show with a talk about the inspiration behind the book, and how it became a play on our stage. You won’t want to miss the opportunity to meet her those nights, so reserve your tickets today! Kim will also be on hand those nights to personally autograph books, which will be for sale at the show. Pre-signed books will also be available at our other performances. On Week One (November 10-12), Cornelia will be played by Becca Kilday, Agatha will be played by Kaila Rubin, and Bo will be played by Holly Lotter. On Week Two (November 17-19), Cornelia will be played by Alice Lear, Agatha will be played by Merynn Flynn, and Bo will be played by Hetta Coleman. We are all excited by what each of these actors brings to each role, and can confirm that each week’s performances will have a different feel and flavor based on how our actors have interpreted their roles. It’s a great reason to plan to see it twice!